Heat pumps have been suggested as a potential alternative to gas boilers for space and water heating. Whilst currently used mainly for heating properties with no gas connection, the UK Committee on Climate Change (CCC) has even proposed banning gas boilers in new build homes from 2026. 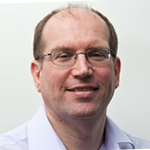 This article compares Air Source Heat Pumps (ASHP) and gas boilers. A heat pump can be used to extract far more energy from the heat source (the air, the ground or a body of water) than it consumes. Heat pumps are measured according to their coefficient of performance or COP (sometimes CP or CoP) and typically produce a COP of around 3.5. That means a heat pump using 1kWh of electrical energy can deliver 3.5kWh of heat, making it competitive in the right circumstance with fossil fuel sources that may initially appear cheaper per kWh. At March 2019 prices, domestic electricity was circa £0.18/kWh with gas at circa £0.04/kWh, meaning that a heat pump would have to deliver a COP of above 4.5 to deliver a cost benefit on operating costs. If fossil fuel prices rise faster than electricity in the future (driven by higher gas prices or a carbon tax?) this would deliver a cost benefit at a lower COP. One off installation costs also need to be taken into account; it is much easier to do a new installation in a new house than change an existing gas boiler central heating system to use a heat pump. Air and Ground Source Heat Pumps may be eligible for the Renewable Heat Incentive (RHI) which pays incentives, for seven years, for those using renewable heat. (Read Ofgem’s Essential Guide For RHI applicants). Why Air Source Heat Pumps (ASHP)? 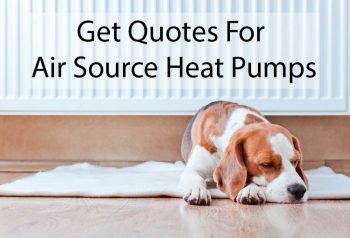 Air source heat pumps are likely to be cheaper and easier to install in the home than ground or water source heat pumps although their “Seasonal” COP will be lower. This is because in winter using the ground or flowing water as a heat source gives access to warmer and more consistent temperature than the air. All three types of heat pump are best installed in new homes that are well insulated, where space heat demand is low. Ground source heat pumps can be costlier to install and require the drilling of a deep borehole (typically around 20-50m in depth but can be deeper). Pipes can also be laid in shallow trenches but that requires a much larger area of land, not available to the average home. Water source heat pumps are associated with large bodies of water such as a lake or river and again these are often not accessible for the average home. 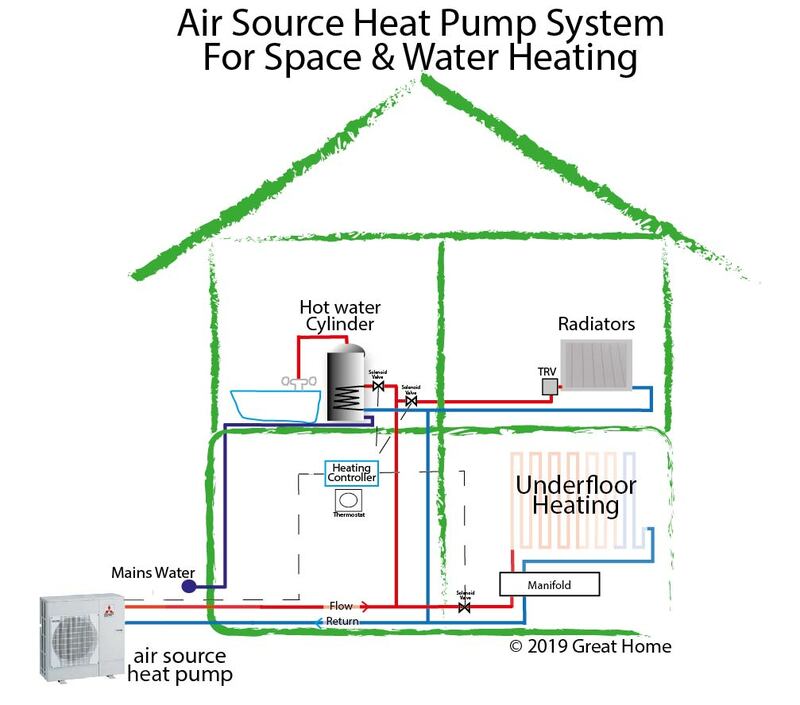 Due to the much higher capital cost, ground and water source heat pumps are better suited to larger systems that serve a number of homes or a commercial building. The ASHP itself looks much like a stand-alone air conditioning unit (see simplified image) and sits on the outside of your home. Like a gas boiler it provides heat to supply hot water and space heating. Not shown in the image are the control systems used to manage the heat flows to the space and water heating. Heat pumps work most efficiently when delivering a flow of water at around 35°C, rather than the 60°C typically delivered from a gas boiler. As the water temperature is lower, radiators need to be larger than those used for gas boilers. Underfloor heating, which needs a much lower temperature anyway, is a good option if it can be installed as part of the concrete floor slab. These differences make it generally more cost effective to install a heat pump in a new home, rather than having to change over an existing gas central heating system, However, if a house with an existing gas boiler has been upgraded with better insulation then the overall heat demand will be lower and will make an air source heat pump more attractive. Air source heat pumps are installed outside the home, so there are some considerations related to where the pump can be mounted (no closer to the property boundary than one metre) and to avoid visual intrusion (particularly in listed buildings). Domestic ASHPs are typically available in the 4-15kW output range, compared to 12-30kW output for gas boilers. Heat pumps are most suited to installation in better insulated quality built homes that demand lower heat output. That said, people are most suited to well insulated quality built homes! It is smart to make your home as energy efficient at possible before you decide on the type and size of a space heating system. Whilst it is hard to be specific, the table below shows some typical levels. Air source heat pumps could provide heating for a wide range of different homes, although would struggle with poorly insulated larger homes. With Passivhaus , space heating requirements are minimal and many occupants would never need the space heating on at all. As heat pumps operate at lower temperatures than gas boilers, stored water may only be heated to around 50°C. This is often fine for household use but to ensure there is no risk of Legionella build up (a type of bacteria) an immersion heater is used once a day to heat the whole tank from 50°C to 60°C. Air source heat pump costs for a new installation are a little higher than for a gas boiler (between £800 and £2,500 depending on house type). This is primarily down to the costs of the heat pump itself versus a gas boiler. The table below shows indicative pricing available from UK plumbers merchants for a typical gas boiler and for different power output heat pumps. 35°C rather than 60°C). However, heat pumps are ideal for use with underfloor heating which, although more expensive to install than radiators, does free up wall space and also delivers a more even temperature throughout the room. The other components of the two systems are similar in costs and installation time (pipework, controllers and control valves). Deciding whether to replace an old gas boiler with a newer gas boiler or an air source heat pump depends on a number of factors. The table above shows that the air source heat pump is likely to be circa £2,000 more expensive than the gas boiler but there are other factors to take into consideration. If the boiler is quite old then there may be other parts of the system that also need to be upgraded (see table below) as gas safety regulations change over the years. A site survey would need to be done by a Gas Safe Registered Installer, to identify if any or all of this work needed doing. Upgrading of any electrical wiring, the hot water cylinder and the control system will probably need to be done with either a replacement gas boiler or a heat pump. A key question to answer is whether the radiators are of sufficient size to heat the room using the lower water temperature provided by the heat pump. If not then these will need to be upgraded in size. However, it may well be smarter to spend the money on upgrading the insulation in your home, reducing the energy required to heat each room; in this case the old radiators may then be suitably sized to heat the better insulated room with a heat pump. 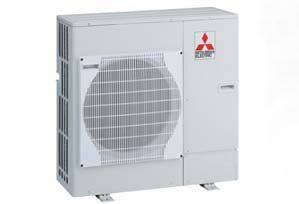 Air source heat pumps have warranties of 3-5 years. If a new hot water cylinder is required these often come with a 25-year warranty. How Do I Find An Installer For An Air Source Heat Pump System? There are a variety of routes to try. A simple one is to use the Renewables Guide Quote Service. Alternatively you can find individual Microgeneration Certification Scheme (MCS) certified installers by visiting the MCS website.